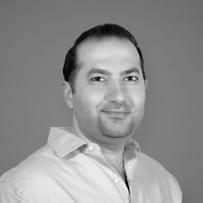 A router’s configuration can make or break your VoIP call quality and experience. There are business-class routers that are specifically engineered to handle VoIP traffic (see The 7 Best Routers for Business VoIP Systems for a list). Although small businesses can definitely benefit from small business routers, many will end up using the same routers that home users buy. And these businesses are using these routers for their business VoIP needs. While a router purchased from Best Buy may not be the ideal hardware to manage business data traffic, many of the newer consumer routers are quite powerful. Many of them also have options in their management interfaces for optimizing VoIP. If you are shopping for a router for home office or business, your budget only allows for a consumer router (usually at a sub-$200 price) and you intend to use the router for bandwidth-consuming purposes such as VoIP, Video conferencing, there are some considerations to know before you buy. For VoIP, buy a dual-band router. These routers transmit Wi-Fi at both the 2.4 and 5GHz radio frequencies. Dual-bands allow you to assign wireless clients to use one of the bands for different purposes. The 5GHz frequency allows for faster data traffic and has less interference. Therefore, when you want to use VoIP, connect any devices to the router’s 5GHz network. The 5GHz band has a shorter range than 2.4 though, so wireless devices making VoIP calls will have to be closer to the router. 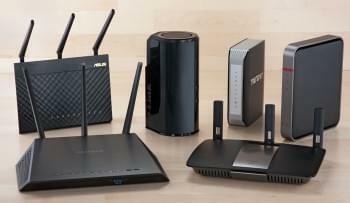 You want to buy at least an 802.11n router, but a better choice is an 802.11ac router. 802.11ac is the latest wireless networking standard and provides performance gains over 802.11n. 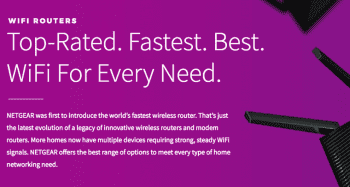 Be advised, you will only experience the best 802.11ac performance if your wireless devices also support 802.11ac. The new MacBook Air and Pro have 802.11ac integrated as do many of the smartphones released within the last year. If you have a small business with many devices which may be engaged in VoIP simultaneously—perhaps a small call center with users connected wirelessly—consider one of the newer tri-band routers on the market. 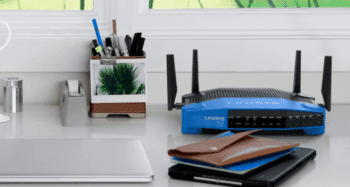 These routers such as D-Link’s AC3200 Ultra Wi-Fi Router (DIR-890L), the Linksys AC2600 MU-MIMO Gigabit Router (EA8500) and the Netgear AC3200 Nighthawk X6 Tri-Band WiFi Router (R8000), have three bands instead of two. They have one 2.4GHz band and two at 5GHz. The two bands are used for load balancing wireless performance. For example: If a wireless device connected to one of the 5GHz band is making a VoIP call, it’s using a lot of bandwidth. 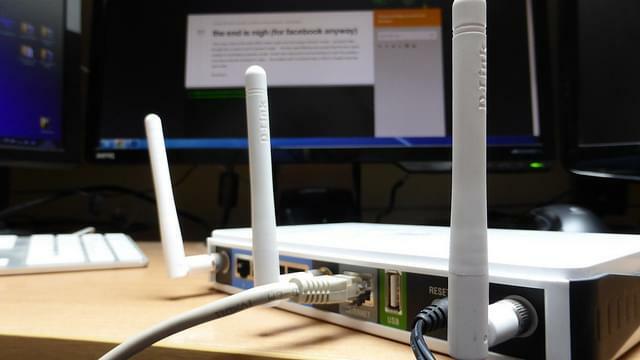 As other devices connect to the network, a tri-band router will place them on the other 5GHz band so that bandwidth is allocated to maintain network performance. This type of load balancing happens seamlessly between the two 5GHz bands and is courtesy of a feature in these routers called MU-MIMO. You won’t have the best experience from MU-MIMO tri-band routers unless your wireless client also supports the MU-MIMO feature, but testing shows that even without MU-MIMO-enabled clients, there are some performance gains in networks with many wireless devices connected to a router at the same time. Most routers have QoS (Quality-of-Service). This is a feature found in a router’s management interface that optimizes data traffic. You can tweak this feature for Voice over IP calling. In the examples below, I am using Netgear’s Nighthawk AC1900 Smart WiFi Router (R7000). This is a popular consumer router and is one of Amazon’s 10 best-selling routers. Although the screenshots and instructions are particular to the Nighthawk, most of the newer dual-band home routers have the same QoS capability and the settings don’t vary much. In the screenshot are settings under “QoS Setup” in the interface for “Upstream QoS” and “Downstream QoS.” In home routers, QoS settings only affect upstream traffic when it comes to VoIP usage. So you are only able to tweak QoS for outbound calls. Leave the downstream settings at the default unless your VoIP provider instructs you otherwise. You may have issues with inbound VoIP calls if you fiddle with the downstream settings. After I run Ookla, Netgear detects my connection’s maximum upstream bandwidth and then adjusts the upstream setting to match. Place the upload speed from the speed test results as the maximum upload data speed to optimize VoIP. Some routers also have QoS rules based on Internet applications and services. 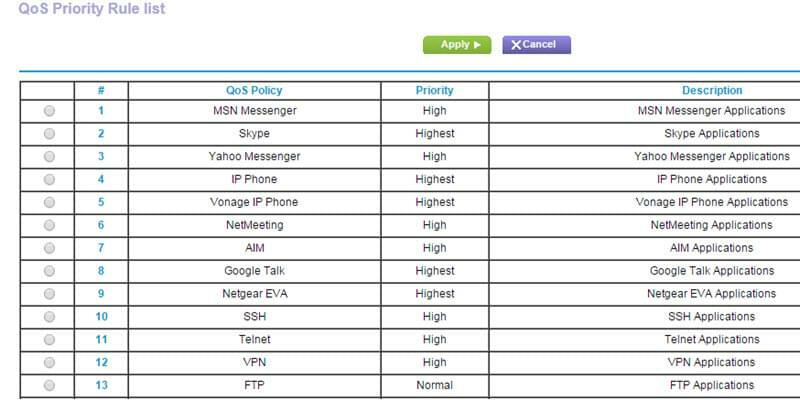 Netgear has rules for several VoIP applications including Skype, Vonage and IP phones. If your router has rules for VoIP services, try enabling them to also boost performance. A few home routers have a feature called Media Prioritization as their QoS. Linksys routers have this feature. With Media Prioritization you can assign “highest,” or “high” bandwidth priority to any device you use for VoIP. A couple of other tips for optimizing VoIP: If you have a dedicated computer or IP phone that you use for VoIP calls, connect that device via Ethernet to the router rather than connecting it wirelessly. This will allow the device to take advantage of the faster speeds of Ethernet. Also, if you have hosted PBX, call the provider for advice about configuring your router’s QoS.